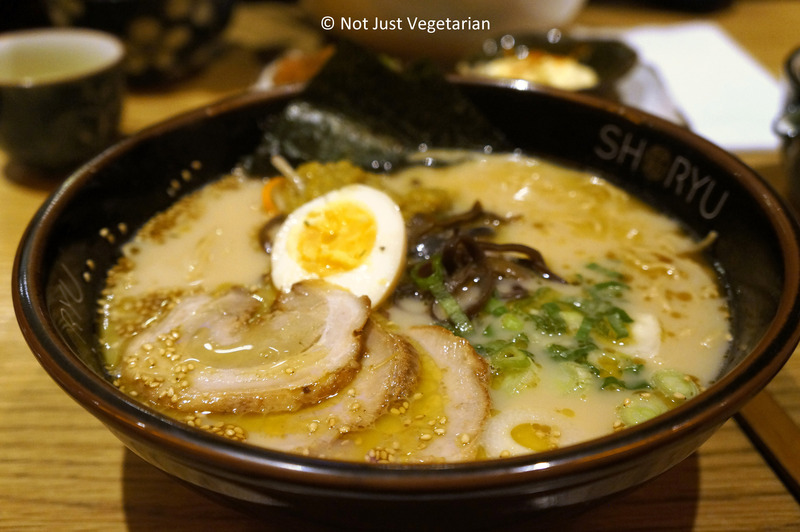 Shoryu Ramen specialises in hakata tonkotsu (thick, rich, pork soup) ramen from Kyushu, Japan. 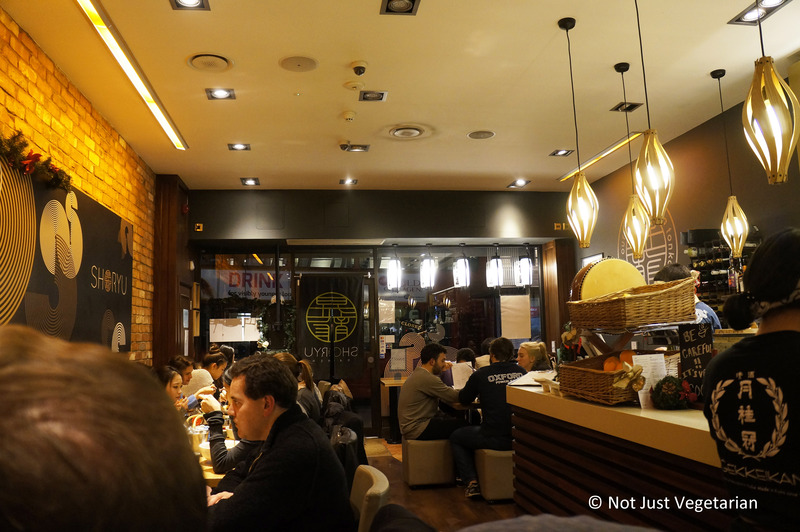 It also serves vegetarian, and gluten-free ramen in London. We got a vegetarian ramen along with a tonkotsu (barbecued pork in a pork broth) – just to compare the two. The yuzu tonkotsu ramen with yuzu (Japanese citrus) chutney was certainly richer and filling, given the long-simmered pork broth. The vegan ramen (could have gotten a gluten-free version too), was flatter, tasted like diluted soy sauce, and lacked depth of flavour. 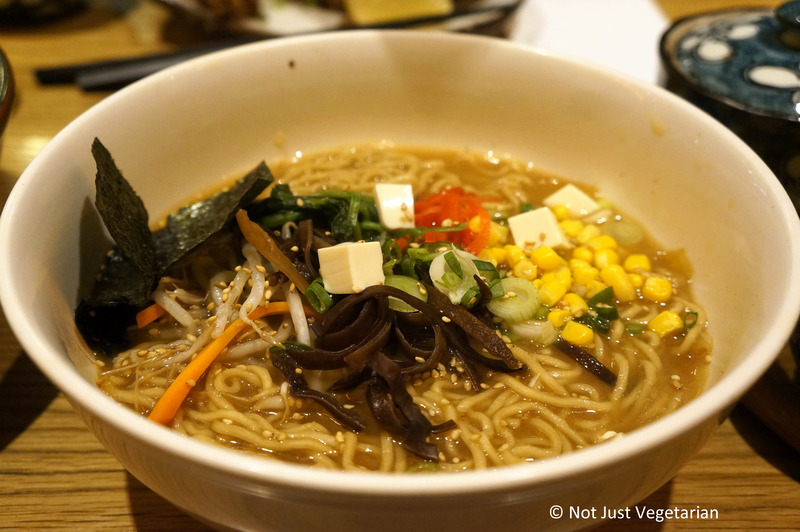 The vegan / vegetarian ramen can be given a level playing ground with the tonkotsu on the flavour dimension with yuzu, red ginger or takana (pickled mustard leaves) as toppings – that is what I would do the next time I go to Shoryu Ramen and recommend the same as well. The vegan / vegetarian ramen cannot compete with the rich velvety texture of tonkotsu, but most vegans and vegetarians do not mind a lighter broth. Adding an egg as a topping can add some richness to the broth. 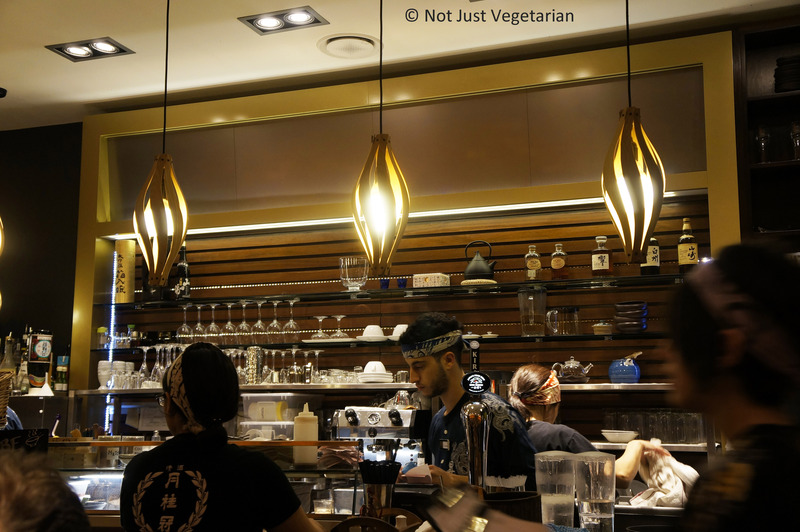 With the vegetarian ramen as it is (i.e., with no toppings), there is no way one would enjoy it – it will always seem less exciting when compared to the tonkotsu and especially if its yuzu tonkotsu. The kara-age (fried chicken) was nice and crispy outside and soft but dry inside and lacked a little something on the flavour dimension. It looks great in the picture below, but it’s not the best kara-age. 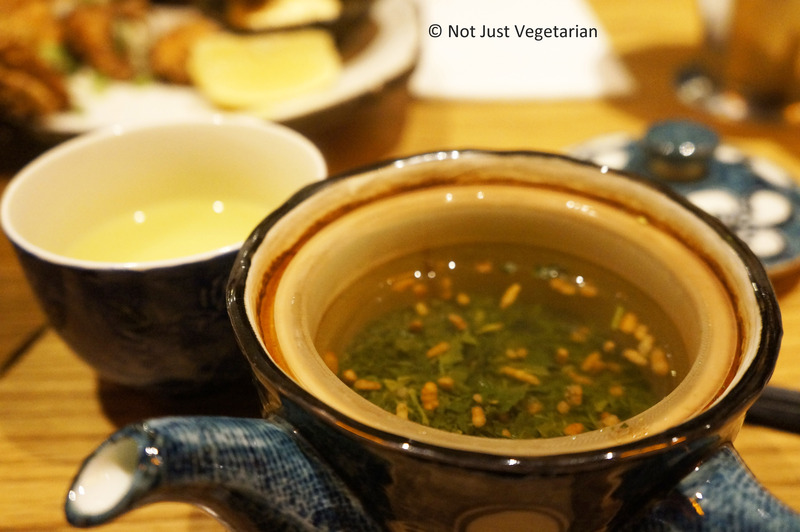 The toasted brown rice in this genmai tea had a very subtle flavour of toasted brown rice, and tasted more like green tea, but was very refreshing never the less. If I go back to Shoryu Ramen it will be to try their spicy ramen and cocktails, not for the vegetarian ramen. 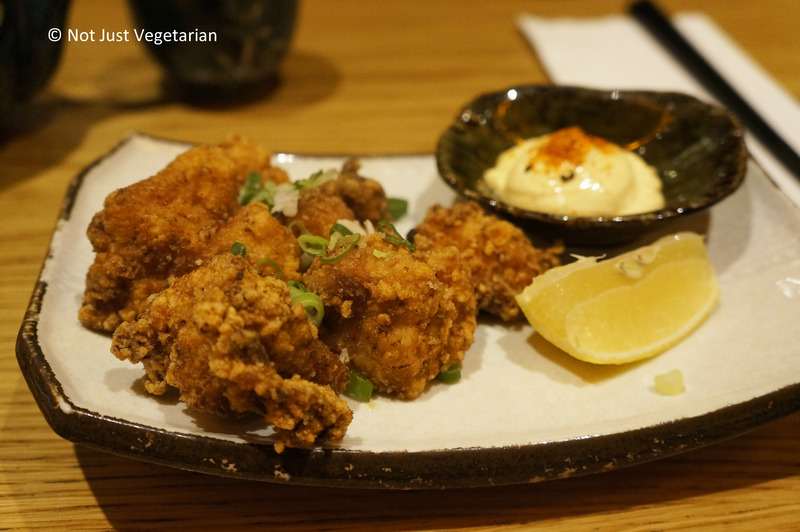 Meanwhile, watch out for a Not Just Vegetarian review of Tonkotsu for a comparison of the vegetarian ramen and the (excellent) kara age (fried chicken)….